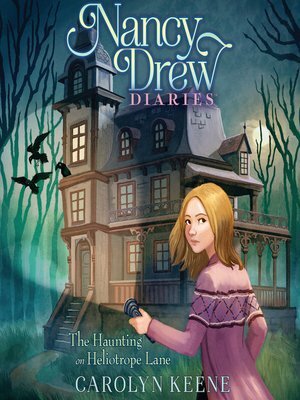 Nancy and her friends must try to figure out why a girl is acting strangely after visiting a haunted house in this sixteenth book of the Nancy Drew Diaries, a fresh approach to the classic mystery series. Nancy's classmate, Willa, needs her help. Willa is convinced something is terribly wrong with her friend Izzy, but everyone has dismissed Willa's concerns, saying it's just teen angst. But Willa thinks it's more than that; she thinks Izzy is possessed. It all started when Willa and Izzy snuck into an abandoned house with some of their friends. After running around and exploring, Willa went in to the basement and found Izzy staring into space. Izzy was conscious, but she was acting weird—she wouldn't speak and she didn't seem to recognize Willa. And when Izzy finally woke up from her trance, she had no memory of the previous few hours. Since then, Izzy's continued to act strangely. She's usually funny and easygoing, but now she's high strung and has intense fits. Once she even threatened to hurt Willa. Nancy is sure there's a rational explanation for all of this and has a feeling she'll find it at the "haunted" house. But what she finds has her questioning her resolve. Could Willa be right? Is Izzy possessed by the ghost of Heliotrope Lane?